Key Difference: The primary difference between a Roti and Paratha is that paratha tends to have layers, which the roti does not. Also, the paratha is basically fried with oil, butter, or ghee, whereas roti is cooked without these things. Indian cuisine incorporates great variety in the types of dishes it offers. 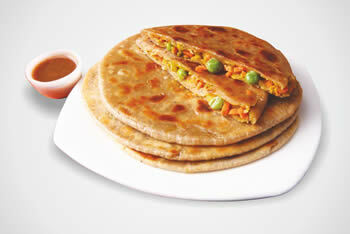 Roti and Paratha are just two of the myriad delicacies that are available. Both are types of Indian flatbreads that are often used as accompaniment to savory soups, gravies, and other dishes. These are often a staple of Indian cuisine and will commonly be present at nearly every meal. Roti is more of a generic term. It represents almost the entirety of the Indian flatbreads. 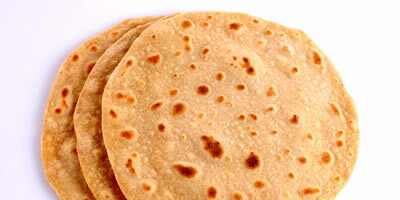 There are many various types of roti, which is why there is so much confusion regarding it. In the most basic sense, a roti is an Indian flatbread that is made from whole wheat flour, locally known as atta. A dough mixture is created from the atta and water. Some people tend to add salt for taste, others don’t. Sometimes oil or milk is added to the mixture to change the texture and make the roti softer and chewier. The dough should be soft but not too soft or wet. The dough is then divided into small palm-sized portions and shaped into a ball. These balls or portions are then rolled out either by hand or via a rolling pin into a thin flat circular shape. This is then cooked either on a tava, which is a type of flat skillet, directly on the flame, or in a tandoor, which is an open air coal oven. Once cooked, it is removed from heat and oil, butter, or ghee may be spread on the surface according to personal preference. In fact, this is almost the same process to make a paratha as well. However, it includes a few additional steps. Once the dough is rolled out, it needs to be oiled (or butter or ghee if preferred) and then folded into half. If stuffed paratha, then the stuffing is placed in the center before folding. Then, oil it again and fold it into quarters. It then needs to be rolled out into either a circular or triangular shape, according to preference. The paratha is then cooked onto the tawa. The cooking process again slightly differs from the roti. Once the paratha is placed onto the tava, it needs to be fried rather than cooked dry as in the case of the roti. After one side of the paratha is cooked, it needs to be flipped. Oil, butter, or ghee is than liberally spread on the surface of the paratha and it is flipped again. Oil, butter, or ghee is then spread on the other side. Once the paratha is cooked evenly on both sides and has turned golden brown, then it may be removed from heat. It is best eaten hot, right off the tava, though it may be stored without consequence. As it can be seen, there are many similarities between a roti and a paratha, which is why the two are often confused. However, in summary, the primary difference between them is that paratha tends to have layers, which the roti does not. Also, the paratha is basically fried with oil, butter, or ghee, whereas roti is cooked without these things. Parantha, parotha, stuffed paratha, lachha paratha, etc. Typically does not have layers. Thicker. Can have multiple layers.